SITC Conference, Maryland · 2017, Paris S. et al. further enhanced with HfO2-NP + 4Gyx3. In mice inoculated with 4T1 cells treated with HfO2-NP + 40Gy, a marked increase of immune cell infiltrate (CD8+) was observed in tumors when compared to tumors in mice inoculated with 4T1 cells treated with 40Gy and control. 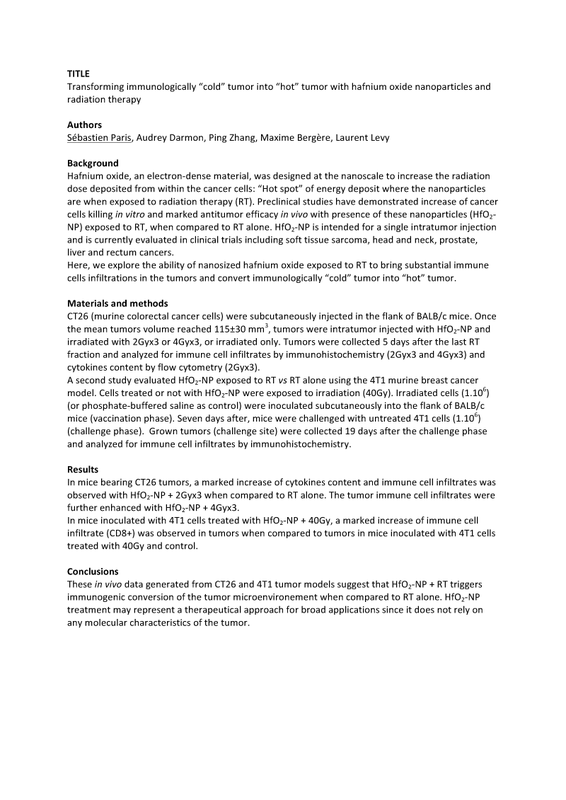 Conclusions: These in vivo data generated from CT26 and 4T1 tumor models suggest that HfO2-NP + RT triggers immunogenic conversion of the tumor microenvironement when compared to RT alone. HfO2-NP treatment may represent a therapeutical approach for broad applications since it does not rely on any molecular characteristics of the tumor.